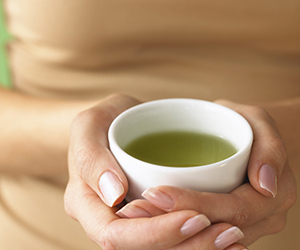 We’ve all heard about the health benefits of green tea. It’s good for you! One reason green tea is beneficial for you is because it can help you get more out of your workout. Green tea can help you sweat harder, firm faster, and get more out of your time at the gym, making it the health enthusiasts drink of choice. Caffeine, of which tea has moderate amounts, has been shown to improve physical activity by altering the way our bodies use fat, making it more available to us as energy. This means we can get a better boost during our sweat session with a boost of caffeine to help us along the way. As if it were meant to be, the caffeine that allows us to get the boost of energy we need to burn our fat for energy also means we are increasing the amount of fat we are burning during out workout. Our bodies tend to want to use the easiest sugars first, so they’ll use the ones in our blood and muscles first, but if green tea makes it easier for our bodies to get rid of fat, let’s do it! And it gets better. You know how coffee can upset your stomach, or give you heartburn? Green tea isn’t as likely to upset your stomach and interrupt your workout the way that coffee can, so you are free to move about the weight room, or group exercise room as the case may be. Now that you have all this extra energy, your body is primed for fat loss, and your tummy is feeling fine, you have one thing left to do...plan your workout. In addition to tea’s antioxidant power, it also contains L-theanine, which can help boost cognition. Thanks to the continued fitness benefits of green tea, you are armed with the smarts to remember all your favorite exercises, and each and every modification of them you could want to do. As you can see, you don’t have to go overboard and change your whole routine. Simply adding a steaming cup or two of green tea to your morning can offer that well known myriad of health benefits, and give you that extra edge at the gym you’ve been looking for too.